Tiered pricing is known as an effective pricing strategy for upsales since it offers buyers with multiple appealing options when they come to choose their order quantity. This is a touching point since customers are willing to spend their budget on your stores, they have the incentive to purchase more if your offers are genuinely engaging and exactly meet their desire. Integrating Better Change Qty in your Place Order page will bring you more benefits than you think before. This blog will show you these surprising advantages of tiered pricing application in online stores. It is undeniable that choosing quantity is the must-noticeable step for e-stores in which customers need to go through to purchase their favored items. Store owners definitely can make full use of this stage to bring back more sales. One of the ideal approaches is putting tiered pricing options which allow shoppers to have various better choices when they consider to buy more items with more discounts. For example, store admin can make several offers such as buy 2 to get 10% discount, buy 5 to get 30% sales and so on. Even customers only need one; they can consider buying more for their friends or relatives because of the appealing discount that they do not to skip by. As a result, both parties get benefits. 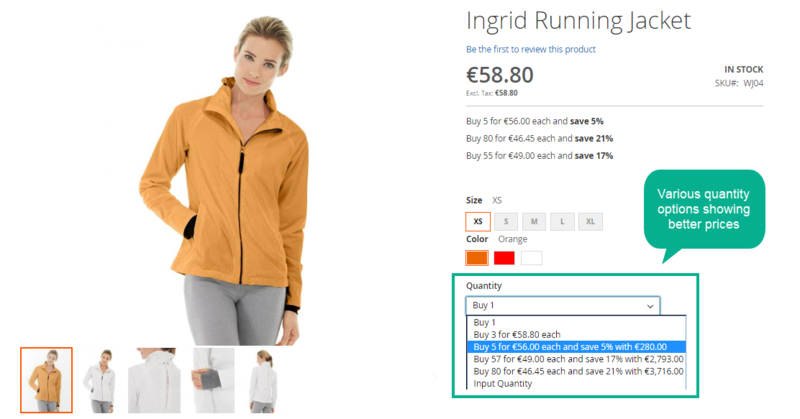 So why we hesitate to integrate Better Change Qty function in the checkout step of consumers? In Default Magento 2, Tiered Price only can be shown as a notice; customers cannot configure them with ease. Hence, e-commerce needs an advanced tiered price plugin that can help them strengthen their pricing strategy. By this, shoppers can flexibly choose their wanted quantity of products by clicking to the available options offered by stores. And consequently, tiered pricing will boost conversion rates on your stores. Tips: The middle tier is generally where you are going to get most of your revenue. It also the most popular option that you notify your customers to choose. Everyone loves discounts, even they do not lack money to shop, they still fall in love with sales and promotion as exciting as receiving a gift. Understanding that, online stores can offer them the best discount with clear information showing right in the quantity choosing section. For example, buy two products with 20% discount. The total cart is $50; the discount amount is $10 then you will need to pay for only $40 to get double items. 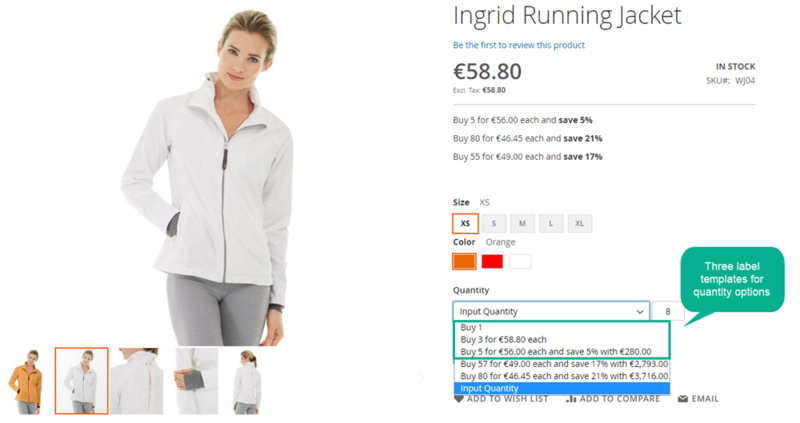 This allows buyers to have the most explicit preview of their purchase if they choose that quantity option. Therefore, tiered pricing contributes to customers satisfaction and fulfillment. And of course, customer experience is the thing that every store desire to gain at the end. 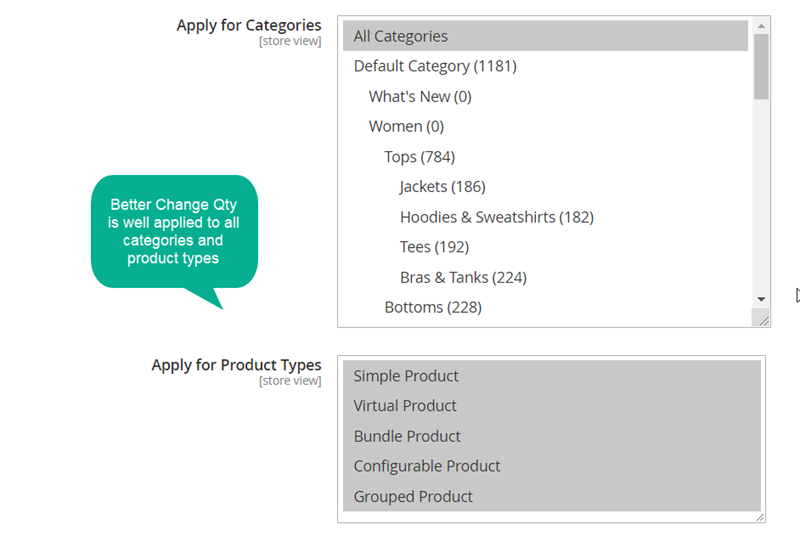 Better Change Qty brings in a new style of quantity input in Magento Default with various quantity options. The rule will be that if customers buy more, they will gain better prices. For example, the price for 01 T-shirt is 20$, 03 T-shirts is 18$, and 05 T-shirts is 15$. Also, These discounts will be displayed clearly right on Quantity section besides product image on Category Page, Product View Page, and Wishlist Page. Therefore, customers are well suggested and can easily select their preferred quantity for better prices. Product Quantity Increment: The quantity difference between steps will be calculated as increment value (equally increasing) for an individual product. The default increment is 1. Fixed Value: With this option, admin can set the specific fixed increment value for all products. For example: With fixed value is 2, Option 1 as 2 items, Option 2 will be 4 items, Option 3 will be 6 items. Custom Value: The items quantity will be set freely regardless of the rule. For example, The 4 steps will be 1 item, 3 items, 5 items, 15 items. Moreover, store admins can set the limit for quantity option number basing on product quantity in inventory, fixed value or both. By this, they can easily customize quantity step correspondingly with specific price strategies and promotion campaigns. By attracting customers with beautiful labels and appealing extra offers, they will definitely stay still and consider your offers, then you can keep them longer for enhancing your conversion rate. It will be a deficiency if online stores do not have tiered price in the quantity choosing field. With the sufficient merits that Better Change Qty brings about, e-commerce doers can offer the best combo deals to their potential customers, then drive up sales and customers experience significantly.